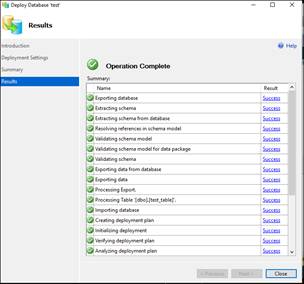 Copy jobs from one SQL Server to another using SSIS. 1. You need to login to the Source Server first. This is the Server where your Database, which needs to be migrated to Azure, resides. 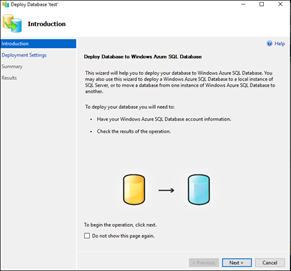 Login with your account and go to the Source database-> Click on Tasks-> Deploy Database to Windows Azure SQL Database. 3. Next screen will be Deployment Setting Screen where you need to provide the details for the target Server. Under the Specify Target Connection pane you will see a tab to enter Server connection. Click on the connect button which is situated at the right side of the server connection box. A new Connect to Server window will be popped up and there you should furnish the details of the target Server name and Authentication details. After entering the details click on connect. 4. Upon Clicking next, you will be presented with the below window where you can see the connected server name. 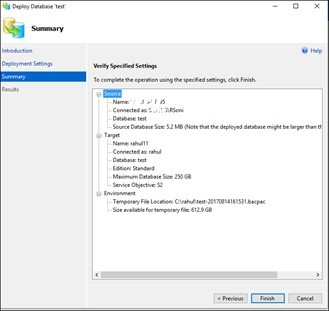 you need to furnish some details like the new database name and other seeing details like Edition of windows Azure SQL Database, Maximum database size in GB and Service Objective. Here in our example I have selected “Standard” as the edition of Windows Azure SQL database and 250 GB is what I have mentioned as the Max size of the database and S2 as the Service Objective. Also, you need to specify a backpac file path in the Deployment Settings window. Once you are done with all these things, click next. 5. Upon clicking next, a summary page will be shown which will have all the details about Source Server and database, target server and database and environment details. 6. Validate if all the above details are correct and proceed to click finish. Upon finishing the wizard you will see Operation complete message on the screen once all the operations such as Exporting database, Validating database, processing objects, importing database are complete. 7. To verify whether your newly migrated database has been migrated successfully or not you can go to Portal and check it. 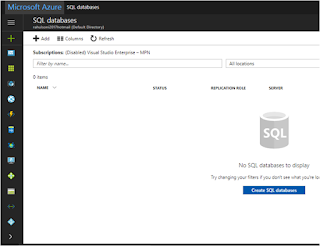 Login to portal.azure.com with your credentials and see if the newly created database has been created under SQL Databases Pane. 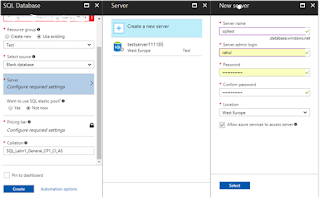 In our example, I logged into Azure portal and verified that the database with the name “test” has been created successfully under the SQL Databases pane. 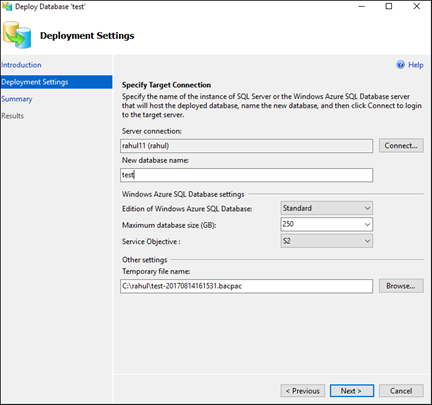 Hence We have seen that Migrating an on-premise SQL server database to Windows Azure SQL Database is very easy and straight forward. The error was login failed and was shown on the connection screen itself. 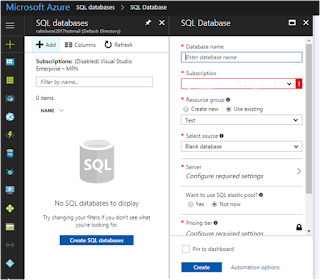 I have already written a detailed article which you can check here-> Create an Azure SQL Database on how to create a SQL Azure database using Azure Portal and connect to it using SSMS (SQL Server Management Studio). Since admin password is required to get connected to SQL database (as in my case I did not create any other login other than admin account), I thought of resetting it. 3) When you will click on SQL Databases you will be shown all the available SQL Databases that are installed on the azure portal. 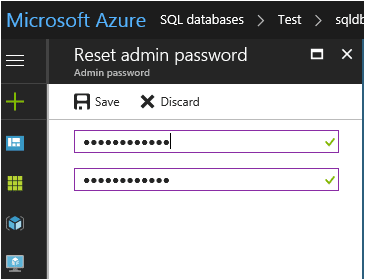 You will need to identify for which Azure SQL database you want to reset password. Please make sure that you select the database for which you have forgotten the password and want to do a password reset. Example here I have selected Test SQL database-and then I clicked on Overview. 4) You will now need to click on the Server name from the overview window. 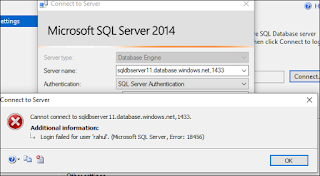 In my example, I will click on the fully qualified server name which is - sqldbserver11.database.windows.net. 5) You will be presented with another window where you can see the “Reset Password” link. 7) Supply the new password and confirm the new password to reset the admin password for Azure SQL Database. Please make sure you enter a password that meets all the security standards Once you have verified both new password and confirm password fields please click on the save option to save the newly set password for the admin account. After resetting the password, you should come back to your SSMS screen and try to connect again using the new password and you should be able to get in. 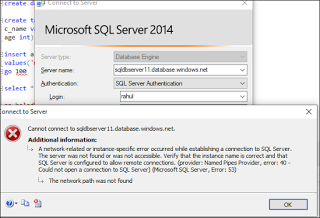 After resetting the password for Azure SQL database (test Azure SQL Database in my example) by following the above steps I tried to reconnect the database via SSMS (SQL Server Management Studio) and I was able to get connected to it. Upon doing some research, I got to know that you need to add firewall rules in order to enable your Azure SQL Database for remote connections. 1) Log in to portal.azure.com. 4) You will be presented with all the details like the Resource Group, Status, Server name, Location, Subscription name, pricing tier etc of your Azure SQL Database. On the top of the screen, you will see “Set Firewall rules” option. You need to click on that option to set the firewall rules. 6) You need to give a rule name in the “Rule Name” Box and specify start IP and End IP of the client or clients from whom you want the connection to be established. 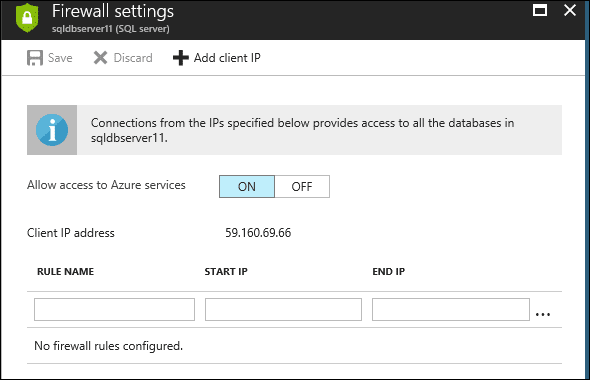 If you want that only one IP should get access to connect to the Azure SQL Databases, then you can just keep the Start IP and End IP same. Otherwise you can specify a range for example- “X.X.X.1 to X.X.X.10”. 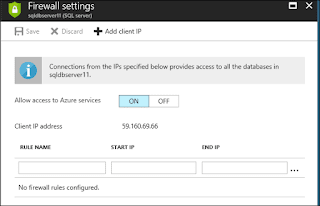 8) After adding the IP of my client machine in the firewall settings, I tried to connect Azure SQL Database from my local SSMS and I was able to connect to it. 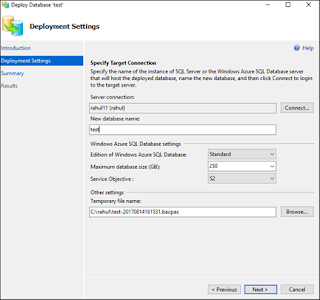 So, We have seen that by adding firewall rules both in the portal and windows (client) we can connect to an Azure SQL database locally as well. Azure SQL Database is a database-as-a-service which is highly performance-driven, secure and trustworthy. With Azure SQL Database, you can now create websites or applications without requiring to manage the infrastructure. This enables you to concentrate more on data and application stuff and back-end is managed by Microsoft. Today we will learn how to create Azure SQL Database using Azure Portal. You need to login to Azure Portal-> portal.azure.com. Please sign up on it if you don’t have an account already. 4) Fill in all the mandatory details like Database name, Subscription, Resource group, Select source, Server etc. 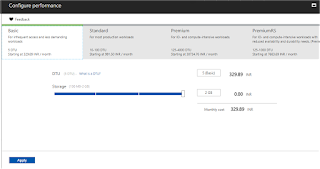 You can use an existing resource group or create a dedicated resource group to be used for the new Azure SQL Database. 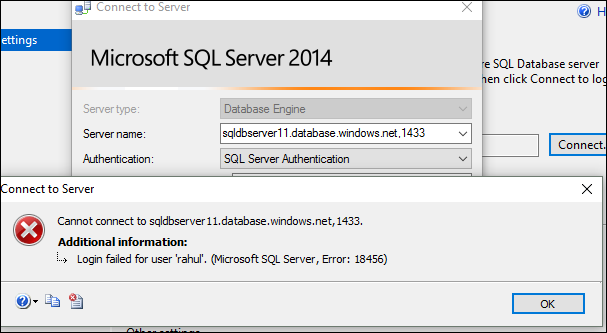 In Select Source box, you can choose to install a blank database. You also have an option to create a sample database or create a database from a pre-existing backup of any other database. 6) If we already have a Server we can choose that by selecting that server. 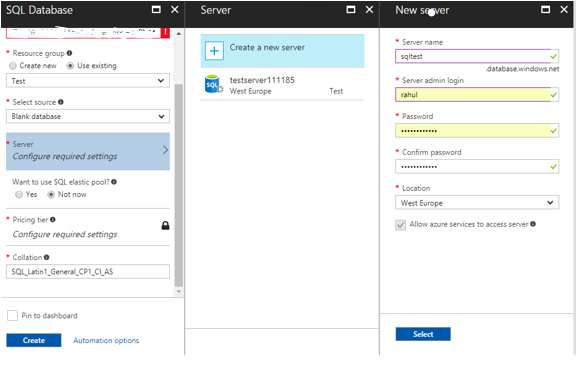 In case we want a new Server to be installed altogether for this Azure SQL Database then we will click on the -> Create a new server link and supplying the mandatory information like Server Name, Serveradmin Login, Password and Location. Here in the example I have taken sqltest as the Server Name, Rahul as the Server admin login (please give a strong password for this admin login as you will be later logging in to the SQL Server using this login only). We have selected West Europe as the location. Allow Azure services to access server will be enabled by default and we will leave it as it is. 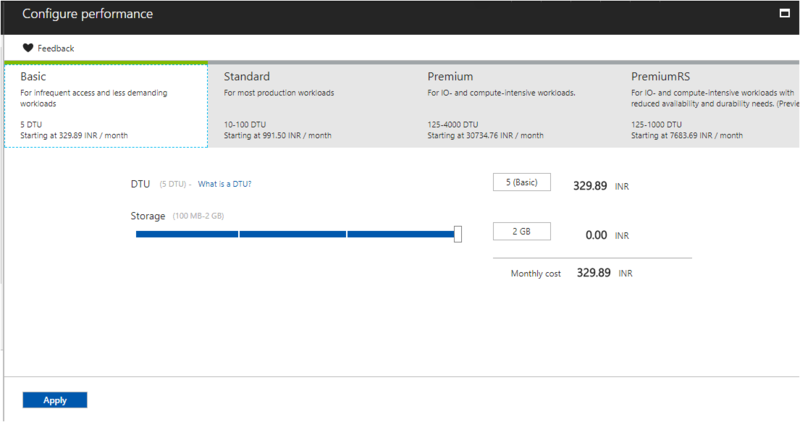 7) Next, we will have to select the pricing tier for our Azure SQL Database. We can choose among basic, standard, premium and premium rs tiers as per the requirements. Then verify the details of DTU and pricing from the same page and once everything is verified don’t forget to apply the changes. 8) Finally, you should select the desired Collation and click on Create. So, this will create your Azure SQL Database which you can connect from database engine and manage your data. Azure Portal seems very user friendly and direct.